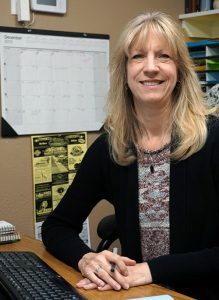 Kay DuBois is the legal assistant for the Colorado Springs motorcycle accident attorneys at the Rector Law Firm. Kay graduated from Harlem High School in Loves Park, Illinois in 1974, and moved to Colorado Springs two weeks later, so she is practically a Springs native! Mrs. DuBois has been working at Rector Law Firm since 2014 assisting the firm with personal injury cases and criminal defense. Her experience working with patients at the hospital, along with her experience caring for a daughter with special needs and a chronic illness, have given her an eye for detail, and the skill needed to organize case files and medical records with compassionate insight towards the needs of the client. Her background is varied, from many years of retail in natural foods to office manager at a massage therapy office while training as a Healing Touch Certified Practitioner. Kay has volunteered at Memorial Hospital in Colorado Springs doing Healing Touch for Oncology patients since 2005.